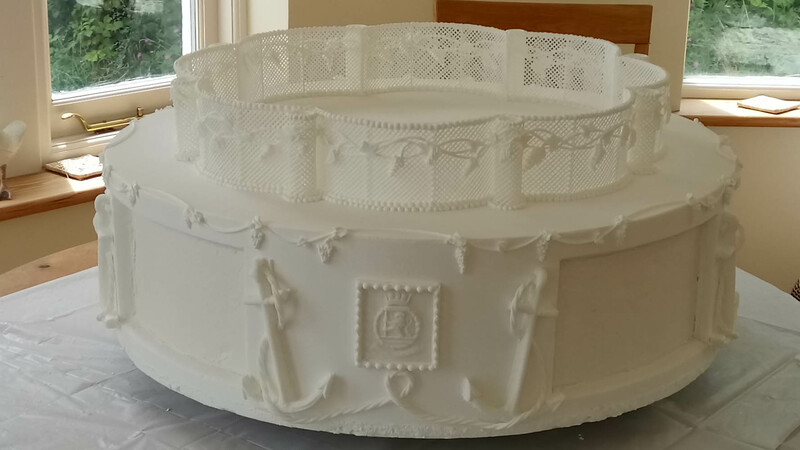 During the summer of 2017 I was involved with a very exciting project in re-creating a full size replica of Queen Elizabeth ll's wedding cake through the British Sugarcraft Guild. 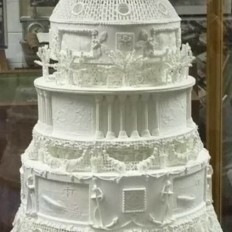 The original cake was created by Peek Frean in 1947 for the Queens marriage to Prince Philip, and a full size replica of this magnificent royal iced cake was displayed in the reception of Peek Freans in London, where it remained until 1989 when the factory was closed. It was then moved to new bakery museum premises for a while until a reduction in funding by Southwark Council forced the museum to move back to the original building. At that time, the replica was considered too large and delicate to move, and was left until other arrangements could be made. 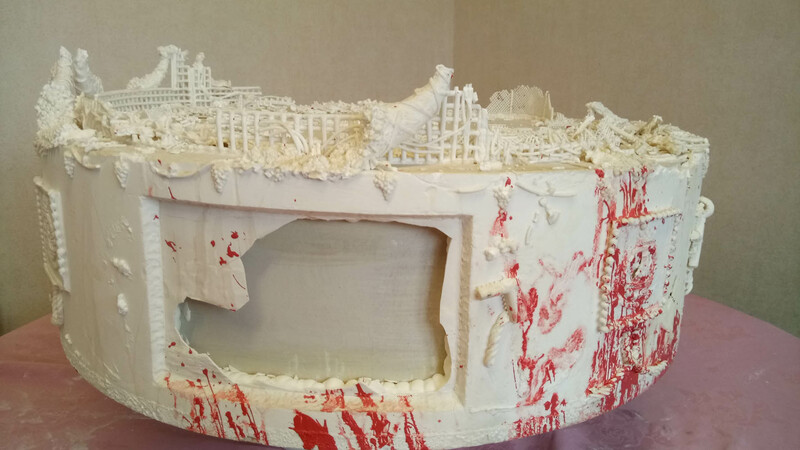 Sadly in July 2015 squatters gained access, broke the casing,dismantled parts of the cake & reassembled it upside down and threw red paint over the whole display! 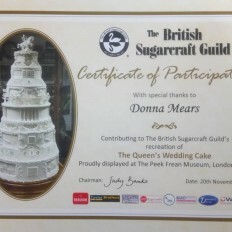 The British Sugarcraft Guild was approached by the Museum staff for help to recreate the replica in time for the Queen and Dukes of Edinburgh's 70th wedding anniversary in November 2017, for exhibition back at Peek Frean. 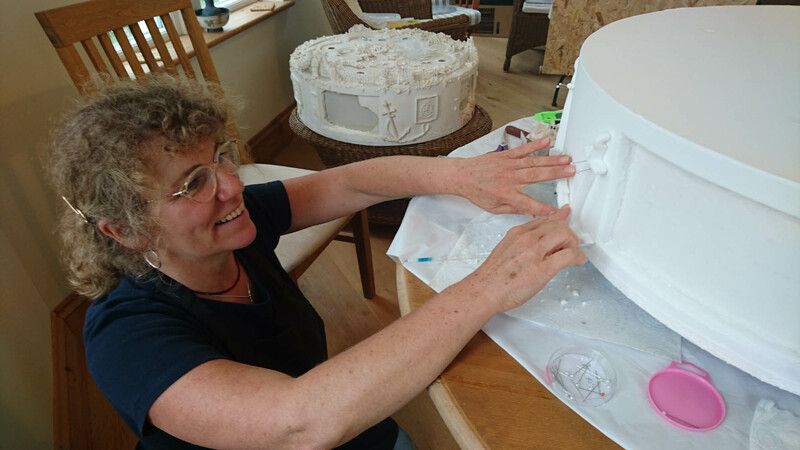 As a royal icing enthusiast I offered my help, however not realizing that I would become 'Team Leader' for the south west & south wales region, as I seemed to be the one with the most experience and knowledge of working with royal icing. 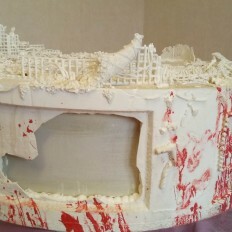 It was my responsibility to ensure that the 5th tier - a whopping 26" diameter dummy cake, was completed to perfection! Regional teams of guild members have worked hard on their individual tier, and embraced this massive UK project, with materials kindly provided by generous sponsors. 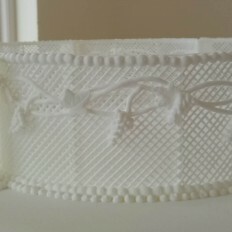 The piping detail and plaques differed on each tier. 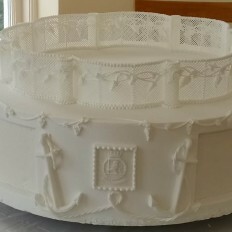 With the use of 3D scanning of the plaques on the original replica, new silicone moulds were made to recreate the delicate pastillage plaques featured on every tier. 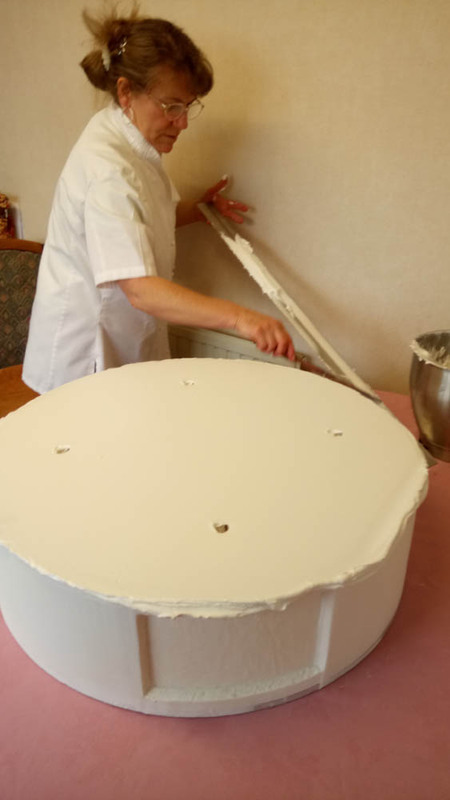 As for the 5th tier, my first task was to have a stainless steel straight edge and side scraper made which were 'man enough' to enable me to coat this enormous cake with several layers of royal icing, - first stage of perfection was achieved with not a blemish or air bubble in sight. 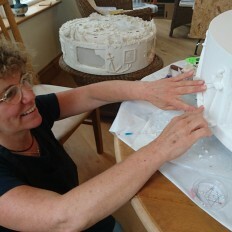 Four recesses were cut out on the side of the cake in preparation for the pastillage plaques of HMS Vanguard at Table Top Mountain. Sections of inner and outer trellis work were piped over polystyrene former's. Pictured here is the completed inner trellis with trellis turrets, and piped vines & bunches of grapes. The outer trellis, cornucopia's piped fruit & blossoms and pressure piped wheat sheaf's were prepared and packaged very carefully , but sent separately. 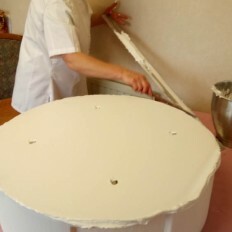 They could not be added until the tier above was in place at final assembly back in London, as the outer trellis overlapped the tier above and too delicate to risk breaking them. 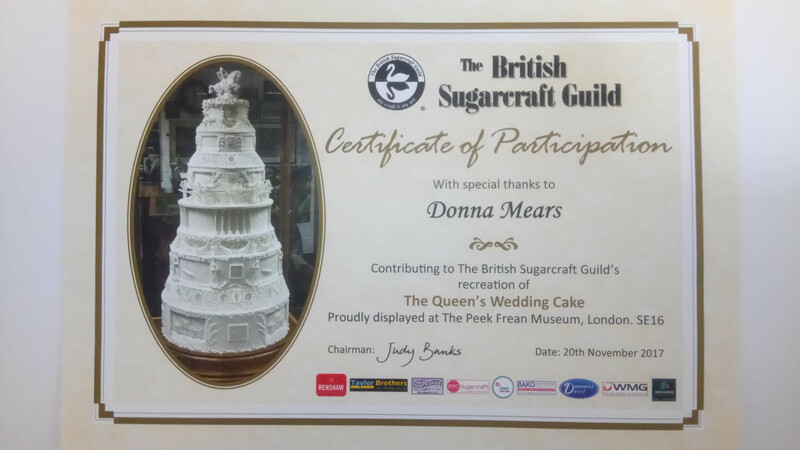 The official unveiling of the completed replica of Queens Wedding Cake took place on 30th November 2017, and the British Sugarcraft Guild has since been honoured in Southwarks Civic Awards for 2018. 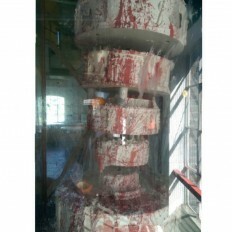 During the restoration there has been much media interest, notably with radio, press and TV. 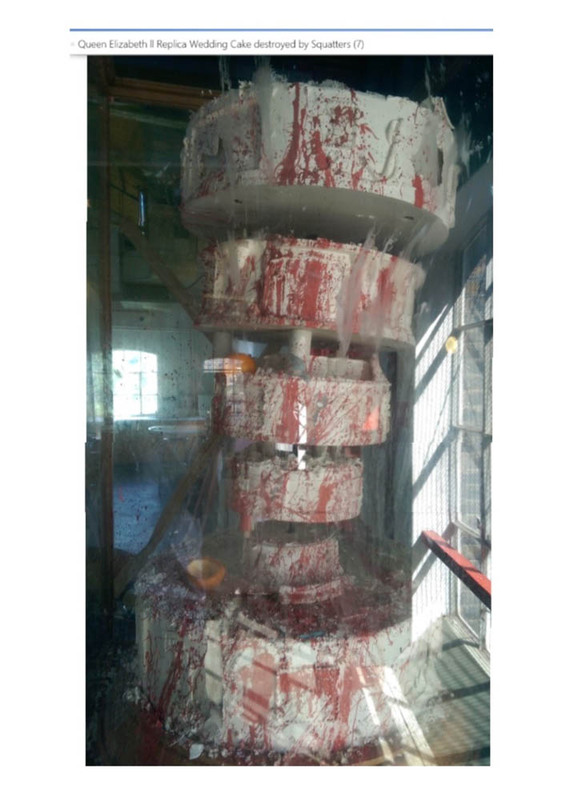 I feel very privileged to have been part of such an fantastic project and a great learning curve for me personally. 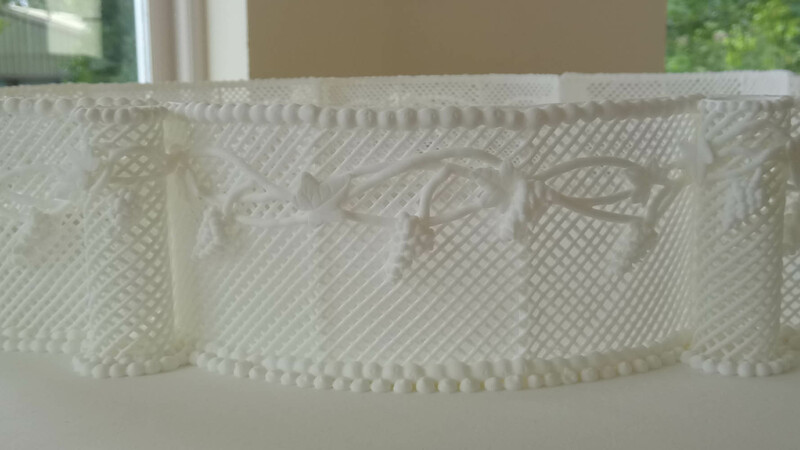 The shear size and intricate detail presented its challenges because our craft has changed so much in recent years, but I am passionate about keeping these traditional master skills alive! !